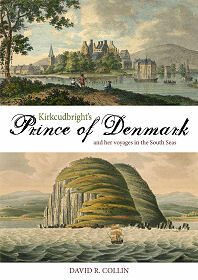 "Kirkcudbright's Prince of Denmark: And Her Voyages in the South Seas" by David R. Collin is a truly remarkable book. On one level it is the story of a small schooner, built in Kirkcudbright as a revenue cutter in 1789, and of those who sailed in her. On another level it represents the author's impressive pursuit of the Prince of Denmark to the far side of the globe. If ever a book deserved to be called a labour of love, then this is it. The result is extensive referencing of original material such as personal and business correspondence, press reports, and the ship's own logs. The slight irony is that the further the Prince of Denmark sailed from Scotland, the more we seem to know about her. Much of the material about the Prince of Denmark's design and construction, at the hands of Kirkcudbright's shipbuilders, has had to be inferred by the author, as virtually no records remain of her. Even the fact that she started life as a revenue cutter - a fast and relatively lightly built vessel intended to intercept smugglers - is indicated mainly because her name fits into a pattern of other vessels that are known to have been built for the Revenue. The Prince of Denmark seems to have left government service in 1819, when she was re-decked, repaired and given a copper coat to her hull. On 12 August 1822, by now 32 years old, she sailed from London for what was to become a completely different life spent in and around New Zealand, the east coast of Australia, and the islands of the western Pacific and Antarctic. Though comparatively flimsy for the role, she spent long periods whaling and sealing, and at other times carried cargo and passengers as the opportunity arose. The author gives as much attention to the many men who owned, captained and crewed the Prince of Denmark as he does to the ship herself, and the effect is to bring vividly to life a period in our colonial past which is far less well known than it deserves to be. Although the Prince of Denmark herself was a very long-lived ship, she seems to have done little to enhance the fortunes of those associated with her. Of her many owners and captains, one was imprisoned for debt, and another eaten by sharks; and no fewer than five were bankrupted, two of them more than once. And as for the Prince of Denmark herself, she ended her days in 1863, her 74th year, when driven ashore in a storm and broken up at a remote island whaling station. Only, that wasn't quite the end of the story, and the building of "Hamlet's Ghost" from the wreckage and her subsequent career rounds off the account very nicely.